Well, I guess it’s about time to write a bit about my move to Norway. Or to finally blog about my “Concerts 2014”. Or plan the summer festivals for 2015. Or … uhm. I saw the new Kaizers movie yesterday. I really liked it – but then, I don’t think I can really judge it. OF COURSE I liked it, since it is about Kaizers, and it actually contains new interviews and both old and new unseen footage. So it is, without a doubt, a must-see for Kaizer fans. In one scene in the movie, Helge mentions that towards the end of Kaizers, in the last months and weeks, the friendship and the bonds between the members grew stronger. I found that really interesting, because (in a completely different context) I’ve experienced that once an “end” is decided, everything kind of falls apart, because there is no need to fix things and keep them together anymore. It’s awesome to hear that this worked out so well for Kaizers and they did not break apart in the end. Of course, this isn’t surprising. The number of fans grew so much that there was just no way to have one family. And just to make that clear right away, I’m not putting the blame on anyone. I’m sure I’m just as much to blame as everyone else. 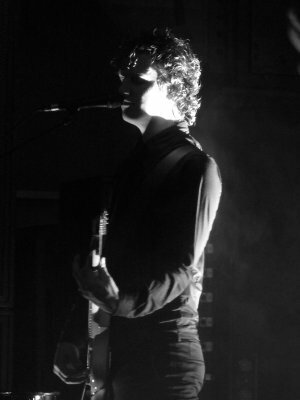 While in my early fan days, I wanted to meet EVERY other Kaizers fans out there, I’ve gotten less and less interested in talking to fourteen-year-olds, I tend to look down on fans that tour for festival shows (why don’t you wait for REAL concerts?! ), and I just don’t understand fans that queue hours before a show. Years ago, there were surely also some fans that kept separate from the rest. But all in all, it felt much more like “family”. I met one of the old DMA family at the screening yesterday, and while we couldn’t even remember the other’s name, we remembered “the old days” right away. Lots of great memories – and I feel that years from now, ALL my Kaizers memories will be from the old days. Violeta? Well, yes, sure. Siste Dans? Yep, I was there. But the good times were back then, long before Violeta. Lots of people “dropped out” of the Kaizers universe since then. That’s totally fine, everybody got their own reasons for that. I just hope that people will remember the times we had, instead of ridiculing them. 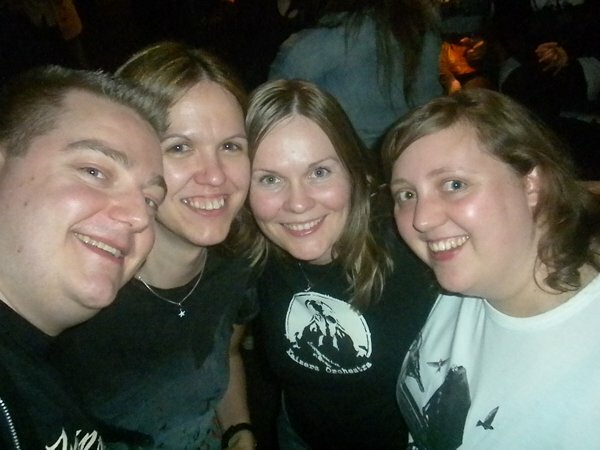 Just a short while ago I was told “well, SOME of us are over Kaizers now …” Hmm. Should I congratulate you now? Because you’re over the stupidities of your youth? Or should I rather pity you because it seems you don’t see that even though this part of your life is over, we were part of something huge and we should keep it in our hearts? OK, I might be getting a bit melodramatic now. 😉 In any case, it’s a fact that for me (other fans might be at different stages in their fandom, of course) the time of one big Kaizers family is over. Finding people to meet up with for Kaizers events is getting harder and harder, and while years ago, I was looking forward to every concert because I knew that – even without arranging anything – I would meet awesome fellow fans, I now hardly care anymore because there are only very few of those people left. And those I can meet without organized events as well. Of course it was great to see that it’s still possible to “unite” fans without too much effort (with a few kilos of confetti or some hundred balloons – even though nobody knew how that would turn out, almost everyone was in). But there are so many fans by now that there is not one community anymore. But one of oldtimers, one of newbies, one of Hjerteknuser fans, … And I hope that all the “everything was better in 2001” fans will manage to find their way to the cinema in the upcoming weeks, to be reminded of what we had. 2012 is almost over – which means it’s time to look back at this year’s concerts! All in all, I saw 60 concerts this year; plus two musicals and three WWE events. The “first place” is shared between Kaizers Orchestra and Die Ärzte this time, with 15 visited concerts each. But they share the first place only if you look at nothing but the numbers. Most of you know where my sympathies are … =;-) And not only the general sympathies, but Kaizers’ concerts were so much more fun as well. In the competition about the worst concert of the year, I really cannot decide between Mas Shake (absolutely uninteresting, boring dance music without any profile) and Die Ärzte in Zwickau (audacious to actually take money for what they delivered there!). In the summer, I attended six different festivals. The nicest of all was by far Odderøya live – and totally unexpected! The festival was so nice and relaxed, and so absolutely professional at the same time. But the other festivals weren’t far behind. And even though this summer was rather cold and rainy – looking at the music, it was perfect! As always, let’s take a peek at the map: The northernmost concert this year was probably the Kaizers concert in Levanger (where we actually wanted to drive back to Oslo during the night, but that was prevented by a snow storm …), the westernmost was Helmet at House of Blues in LA (which was a rather unspectacular concert, but well, if you are a concert junkie and you are in LA, you just HAVE to see at least one concert, not matter which! ), the southernmost was LA as well, of course, but apart from that one, it was Nordic Sounds in Zurich, and the easternmost was Die Ärzte in Vienna (old men flagrantly using their popularity, and the young girls don’t even notice … how appalling! But a nice sunny weekend in Vienna *g*). And finally, a short outlook into the new year 2013: As always, the year will start with some Busters concerts, before the Kaizers tour starts. First in Oslo, then all around central Europe, and finally the conclusion in London. Where WWE will have some events in the same week – how convenient! =;-) In the summer, there will probably be quite a few Kaizers festivals in addition to the yearly festivals. So I guess I won’t get bored next year! Let’s start with the statistics: I saw 49 concerts this year – less than I had expected before I counted, but still quite a lot. Count in the literature reading (of a rock musician *uhem*), the four Sonny musicals and one WWE event, and I’m at an average of more than one concert/event per week again… *argh* No wonder I was kinda tired of concerts and especially festivals a few times this year! Yep, especially festivals: I attended 10 festivals this year, one in early June (Rock im Park), on in mid June (Southside), and the rest in the seven weeks from mid July until early September. OK, I only attended one day for half of the festivals, but that still leaves five full festivals with LOTS of great music! And temperatures between 5°C and 30°C, thunderstorms and waterfalls, mud, and sunburn as well. For the first time, I “worked” as photographer at some of the festivals and spent the first three songs of each band in the aisle in front of the stage. It was fun, no doubt, but I found out it’s not really what I long to do. It’s nice once in a while, but I’ll rather concentrate on the music instead of taking pictures that I’ll never ever look at again (and that are too bad to make any money out of them – especially since I don’t plan to make money out of going to concerts instead of going there to enjoy the concerts!). Of course, most of the concerts I saw this year where somehow related to Kaizers Orchestra – all in all, I saw them 20 times this year. *cough* That might sound boring, seeing one band over and over and over, but it’s not. I love their concerts, I can’t get enough, and for some reason I don’t get tired of seeing them. There were some weaker concerts of course, like the one in Gent or at Eier mit Speck, but then there were so many concerts where I had blinking hearts in my eyes after they went off and couldn’t stop smiling for hours afterwards. Hell, I was close to tears at Vega! Because of Kaizers, and because of the beautiful time I had with my tour- and travel companions. THANK YOU for the wonderful time! Apart from Kaizers, I saw four concerts of Die Ärzte (ok, actually three were not Die Ärzte but Laternen-Joe, but… you know how it is), four of Itchy Poopzkid (including an amazing tour conclusion just a week ago), and four of Monsters of Liedermaching (and these four were all completely different). The last years, I listed the “geographical dimensions” of my concert trips – that’s not really that impressive this year. I was traveling a lot, but not really that far… I guess the south-eastern point would be Wien or Graz, south-west would be Gampel (probably the best festival of the year! Even though Serengeti was also amazing, just way too cold and overshadowed by the shootings in Norway). North-west was Amsterdam and north-east probably Oslo, with Øya and the Spektrum concert. Most impressive concerts? Hmm, that one’s always hard to answer. Especially since all concerts are so different… I already mentioned the Kaizers tour, and all in all, that’s probably my favorite. 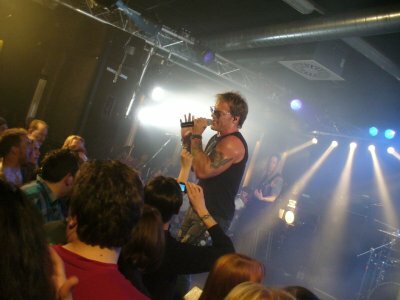 The most surprising concert for me this year was Fozzy in Copenhagen. Yes, in Copenhagen… I never traveled that far for a band I hadn’t seen live before. But it was SO SO SO worth it! They just blew me away. Newcomer of the year was definitely Kraftklub. I hadn’t heard about them before I saw them live at Serengeti, where I instantly fell in love with them. I saw them again at Mini Rock (another great festival I haven’t mentioned yet, but it should be mentioned because it started out as a tiny festival and has constantly grown over the years, without losing its great atmosphere) and then just a few weeks ago at a club show. The club show was so crowded it was hard to enjoy the concerts, but then, it was impossible to not enjoy it. They will make it big! No newcomer but someone I hadn’t noticed before is Wirtz – I saw him at Taubertal, was very impressed, loved his gig at Gampel as well and was a bit disappointed by his club show a few months later. But then, I didn’t know his songs well enough; I do love the album now that I have it. And finally, I must mention Xutos & Pontapés; a Portuguese band that actually played in Switzerland and Luxembourg this year, yay! Great concerts, and a great experience as well. So, what’s coming up in 2012? Actually, I thought at a concert a few weeks ago (don’t remember which concert it was, it doesn’t really matter either): “OK, maybe I should cut back on concerts a bit next year; if I don’t see so many concerts, I might appreciate the ones I see even more.” Makes sense, right? Sounds like a plan, right? Well, looking at my concert schedule for 2012 demolishes that plan, sort of. =;-) There’s already 31 concerts planned; 16 times Die Ärzte, 7 times Kaizers Orchestra (and they haven’t even announced their European tour yet…). Plus probably a few festivals – Mini Rock is pretty much set, Taubertal would be fun again as well, and the rest is up to the bands that will be playing. Guess I will be busy next year as well. Happy 2012! Der Sommer steht vor der Tür (genauer gesagt schickt er schon seit ein paar Wochen die ersten Vorläufer vorbei, wie schön! 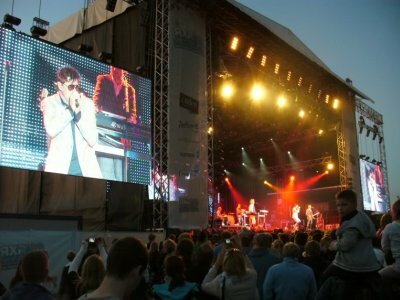 ), das heißt, es ist höchste Zeit, sich endlich mit den Sommerfestivals dieses Jahr zu beschäftigen und zu entscheiden, welche einen Besuch wert sind! Also, hier mal (für mich und Euch) ein kleiner Überblick über die relevanten Festivals diesen Sommer! Los geht’s am Himmelfahrtswochenende mit Rock am Ring und Rock im Park. Hier fand ich das Line-Up zu Beginn sehr sehr schwach. Mittlerweile aber? Echt nicht übel! Von den Headlinern ist zwar nur System of a Down so richtig mein Fall, aber unter den kleineren Bands verstecken sich einige Perlen, so dass es einem ganz sicher nicht langweilig wird. Besonders stark ist natürlich der RiP-Samstag und RaR-Sonntag mit – für mich – durchgehend tollem Programm. So toll, dass ich sogar über eine Tageskarte nachdenke… System of a Down allein wären es schon wert, und dann noch DIESES Vorprogramm? Mal gucken. Auf jeden Fall war das hier schon mal ein schönes Beispiel dafür, wie ein Line-Up wachsen kann! Vom Rock-a-Field-Festival in Luxemburg hatte ich bisher noch nie gehört. Dieses Mal wurde ich darauf aufmerksam, weil Bullet for my Valentine dort spielen. Und woah, was ist denn das für ein Line-Up? Für EINEN Tag? Nicht schlecht, echt nicht schlecht. Die Gefahr ist natürlich, dass sich die Auftrittszeiten überschneiden und man nur die Hälfte der Bands zu sehen bekommt, aber auch das wäre noch die Anfahrt wert. Nur schade, dass es ein Sonntag ist, ein Samstag wäre praktischer; dennoch glaube ich, das kann ich mir nicht entgehen lassen! Im Juli geht es dann weiter mit dem Sonnenrot. Das Line-Up des letzten Jahres war unglaublich stark – daher ist klar, dass das kaum getoppt werden kann. Bisher fehlen im Programm noch ein Headliner und ein Co-Headliner; daher ist es schwer, das diesjährige Line-Up wirklich zu beurteilen. Der erste Blick ist jedoch nicht allzu vielversprechend, zumindest was die Bands angeht. Bis auf wenige “Feier-Bands” wie Bonaparte, Russkaja und die Ting Tings (und natürlich Kettcar, für diejenigen, die mit denen etwas anfangen können – da gehöre ich nicht dazu), ist es doch eher durchwachsen. Was aber nichts heißen muss – ich habe das Sonnenrot letztes Jahr sehr positiv empfunden, da die ganze Atmosphäre sehr schön war und man wunderbar neue Bands kennenlernen konnte. Und genau DAS geht ja nur, wenn man die Bands nicht schon alle kennt! Am selben Wochenende wie das Sonnenrot findet in Schwann bei Pforzheim das Happiness-Festival statt. Die beiden Festivals sind natürlich nicht zu vergleichen, da das Happiness doch sehr viel kleiner ist. 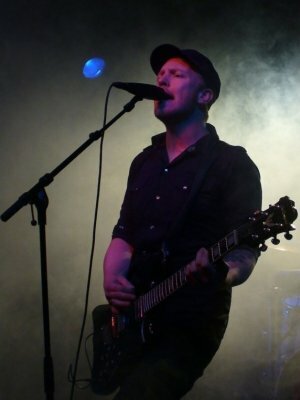 Wobei sie sich mit Sum 41 dieses Jahr aber auch einen ziemlich hochkarätigen Headliner geangelt haben! Für mich sind natürlich Disco Ensemble der Grund, da hinzuwollen, und dazu gibt’s noch Yakuzi und eine Handvoll weiterer namhafter Bands. Sehr sehr vielversprechend! Leider ist bei solch lokalen Festivals immer ein wenig die Gefahr, dass die Dorfjugend aufläuft und Alkohol viel wichtiger ist als die Musik. Mal sehen. Einmal war ich bisher dort, das war vom Programm super und vom Publikum durchaus machbar, wenn auch nicht perfekt. Ich bin gespannt, wie es sich mittlerweile entwickelt hat. Und gleich noch ein Festival am selben Wochenende: das Slottsfjell-Festival in Norwegen. 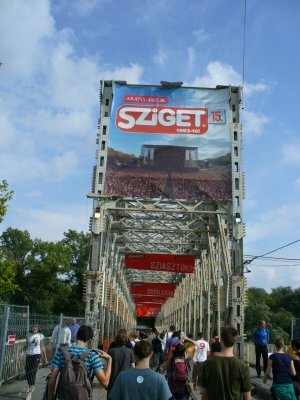 Ich war vor zwei Jahren dort, und das Festival ist wunderschön. Für Norwegen sehr groß, für deutsche Verhältnisse ist das aber immer noch sehr familiär. Dazu aber richtig professionell aufgezogen, was man bei kleineren norwegischen Festivals nicht immer behaupten kann. Aber es passt alles: die Lage, die Organisation, das Publikum, die Verkehrsanbindung – nur das Programm, das passt für mich dieses Jahr leider gar nicht. Kaizers Orchestra sind die einzige Band des Festivals, die mich interessiert – die spielen dafür aber auch gleich zweimal, einmal als Headliner, einmal ein “Privatkonzert” für ein Handvoll Ticketgewinner. Nettes Konzept, aber das restliche Programm reißt das leider nicht raus. =:-( Na ja, nächstes Jahr dann vielleicht wieder? Das Mini-Rock hat sich im letzten Jahr zum “Mindestens Medium wenn nicht fast schon Maxi”-Rock entwickelt, ist dabei aber geblieben wie es war – sehr positiv! Dieses Jahr zeigte sich dann, dass sie den Stand vom letzten Jahr wohl nicht halten könnten. Kein Wunder, Fettes Brot als Headliner waren schon eine Nummer, die sich nicht leicht wiederholen lässt! Daher habe ich sehr skeptisch aufs Line-Up geschaut und hatte das Festival für dieses Jahr innerlich schon abgehakt. Nachdem nun aber noch Disco Ensemble und die Monsters of Liedermaching bestätigt wurden, wendete sich das Blatt… und hey, La Vela Puerca sind auch dabei, sowie ein ganzer Haufen “oh den Namen kenne ich, die wollte ich immer schon mal angucken”-Bands. Also, beide Daumen nach oben, und dabei werden sie noch ganz fest gedrückt, dass das Festival auch ohne einen Headliner wie Fettes Brot das Niveau halten kann! Mitte August dann DAS Festivalwochenende des Jahres. Ich verwende das Taubertal jetzt einfach als Synonym für Taubertal, Open Flair und Rocco del Schlacko, obwohl sich das Line-Up der drei Festivals natürlich geringfügig unterscheidet. 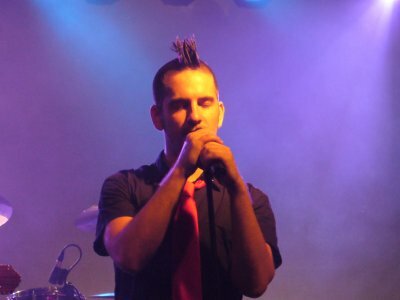 Das Rocco ist klar “abgeschlagen” mit weniger Bands (dafür ist es aber auch kleiner und billiger), das Open Flair hat noch ein paar Extra-Schmankerl (wie die Busters), und das Taubertal – nun ja, das ist halt das Taubertal und damit eh immer toll. =:-) Und das Line-Up? Nun ja. Draufgucken, staunen, jubeln sag ich da nur! Für mich sind wahnsinnig viele Bands dabei, die ich unbedingt sehen will. Jetzt muss ich mich nur noch für eins der drei Festivals entscheiden… wobei das Taubertal natürlich klar vorne liegt, denn: Es ist halt das Taubertal! Das Open Air Gampel hatte ich bisher kaum auf dem Schirm, und es ist ja auch von Süddeutschland aus nicht gerade “um die Ecke”. Das Line-Up macht die Reise allerdings wert! The Offsping und die Guano Apes sind Bands, die ich sonst noch nirgends im diesjährigen Festival-Line-Up gelesen habe, und zusätzlich gibt es noch NoFX, Skunk Anansie, Chemical Brothers, Simple Plan, Seeed und die Baseballs – von den “kleinen” Highlights, allen voran natürlich Kaizers Orchestra, aber auch Katzenjammer und Russkaja, mal ganz abgesehen. Und Schweizer Festivals sind ja sowieso immer was Tolles, ganz grundsätzlich. Mein letztes Sommerfestival 2010 war das Rått & Råde in Stavanger, ein tolles Erlebnis. Dieses Jahr werden Kaizers dort spielen. Das restliche Programm ist zurzeit noch ziemlich unklar… ich hoffe aber auf ein paar richtig tolle Ergänzungen, denn da würde ich gerne wieder hin. Mal sehen, was sich ergibt. One band, two weeks, three off-days. Four friends! An average five hours of sleep… Nine countries, 14 concerts, 6400 kilometers. Uncountable fond memories! Each tour holds special moments, tiny details, funny occurrences that will be remembered. The memories of the concerts fade, but there are a few things that are extraordinary. Those are the memories I’d tell my grand children or write them in “The memoirs of a concert junkie” (if there ever was something like that). Arriving in Vienna at 7:15 pm after four hours of sleep and ten hours in the car. Checking in. At the concert at 8:05. Cologne. The first breath-taking concert of the tour. If the frontman is crying, the audience did everything right. Watching WrestleMania on a tiny screen in the car between Vienna and Munich. Schorndorf. Seemed like nobody in the audience knew the band. During the last song, Bak et halleluja, I looked around and saw smiling faces everywhere – no, not smiling, gleaming. Incredible! Sightseeing in Berlin at 2 am. “Let’s walk over to O2 World. You MUST see O2 World!” And of course, stopping at the wall afterwards. There’s still gaffa on my netbook! 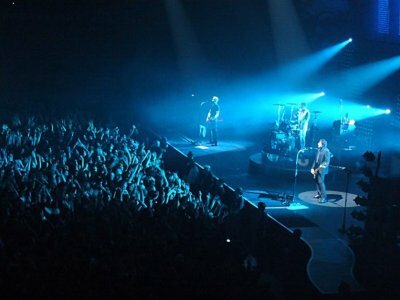 Copenhagen, the last “real” concert of the tour, because Oslo was so much bigger and I was tweeting during the concert. 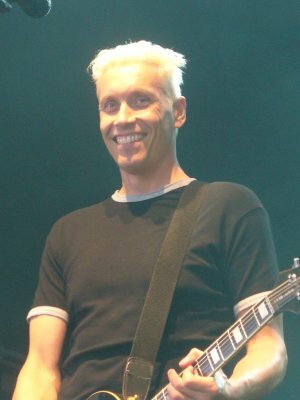 Front row, last song “Die Polizei”, standing arm in arm singing along… and Janove’s expression when he saw us. Thanks so much to all of you who were part of this tour! Most of all my travel comrades, of course, and everybody I met up with at the concerts. Thank you for the amazing time! And also a huge thanks and big smile for everyone who walked up to me during the concerts and said hi – we’ll meet again on the next tour. Because yes, of course: There WILL be a next tour. And I will be there. 2010 is almost over – this means it’s time for my annual concert summary! Let’s start with the numbers – which are surprisingly low, compared to other years: a total of 42 concerts (at least it’s a nice number *g*), nine of these were festivals. Not counting the festival appearances, I saw five Skambankt concerts and three concerts each of Katzenjammer, Monsters of Liedermaching and Kaizers Orchestra (if you count the promo gig in Zurich) – so it was a rather mixed year this time, without real tours of one artist/band! Geographically, Zurich was probably the concert furthest south – or no, not true, Portugal was further south of course, and at the same time the westernmost concert of the year. Xutos & Pontapés in Èvora, yay! In the east, I didn’t make it out of Germany this year, but in the north, I again crossed the Arctic Circle for three Skambankt concerts. Even though there weren’t that many concerts this year, I won’t mention all of them here now; that’s what the reports on www.konzertjunkie.de are for. But of course I’ll point out the highlights! Guess the first highlight was the Dúné concert in Karlsruhe. I went there with little expectations, was shocked during the first few songs, and afterwards, I was so enthusiastic that I wanted to see them over and over again. Unfortunately it worked out only two more times this year: at Schlossgrabenfest in Darmstadt and at Sonnenrot in Munich – both were wonderful gigs that left me absolutely euphoric. And gnaah… I’ll miss their tour now in January, so I hope they’ll return soon! The next highlight was of course the Kaizers tour, or rather the two concerts in Stavanger and Oslo. The concerts were nice, but not special (the Demoner tour raised the bar quite a bit there), but overall this was another great concert trip! Next up were very impressive concerts of Pétur Ben and the Monsters of Liedermaching – I knew Pétur Ben from his gigs as support for Kaizers, but I hardly remembered anything about his show. When I arrived, I saw that there were chairs set up for the audience – what the heck? But it was simply amazing! Within minutes, I remembered all his songs, and his performance captured me completely (COMPLETELY!) . Wow! Similarly with Monsters… Actually, I didn’t really want to go, because I’d seen them before, right? And seeing and hearing the same things over and over again … is GREAT! Their shows are so much fun, every time! After that, there was a little non-concert digression to WWE (it’s in my concert list, that’s why I mention it here, but I didn’t count it as concert *g*), a four-hour Monsters concert in Karlsruhe (AWESOME!) and my first live encounter with Bullet for my Valentine (which I had expected to be even better – but I guess I just wasn’t in concert mood), before my last Norway trip for 2010. Three Skambankt concerts in Northern Norway! And just like in 2007, it was absolutely gigantic! The concerts were getting better from day to day, with a fantastic climax in Bodø. And of course this is… well, perfect would be the wrong way to put it, but at least it’s the best possible way to face the upcoming live-break! If I had to elect THE concert of the year, I’d have to decide between Monsters in Karlsruhe and Skambankt in Bodø. Closely followed by Pétur Ben, Dúné at several festivals, and the whole Rått og Råde festival. And next year? When I look at the list of concerts that are scheduled already, I get dizzy… =;-) Let’s see how many of those I’ll really see in the end. This is the current plan: First, there will be two Busters gigs (Karlsruhe and Tübingen, as always), then the Kaizers tour (first in Norway, then the entire European tour), and then I have to figure out how to fit in Katzenjammer, Itchy Poopzkid, and the Monsters of Liedermaching at the same time (because they are all on tour at the same time *grr*). In the summer, Bullet for my Valentine are on a festival tour, and the way it looks, Taubertal/Open Flair/Rocco del Schlacko will have lots of great bands. So I’m pretty sure that I’ll visit one of these festivals. *g* And then, at the end of the year, the Kaizers musical will premiere. 2009 is almost over, and it’s time to look back at the concerts of the year! Quite a lot again, so I won’t mention all of them but just remember the highlights and “lowlights”. Much more highlights than lowlights, fortunately! ... read on!